The Absence: Kai-Olaf Hesse's "Topography of the Titanic"
They are all long gone - not just the 1,496 passengers and crew of the ill-starred Titanic who slid or fell into the frozen waters of 41°43′N, 49°56′W on April 14th 1912, but also the dense crowd of Harland & Wolff employees filling the streets of Belfast in Robert John Welch’s early 20th-century photos. Solid though they appear in their dark clothing, the shipyard workers on their way to build the Titanic and her sister ships on Queen Island are already a little blurred, as though time could not wait to turn the men and their industry into ghosts. Their shapes seem to echo the somber astonishment of Dante’s exclamation no less that Eliot’s appalled paraphrase, six centuries later: “A crowd flowed over London Bridge, so many, / I had not thought death had undone so many”. The very first photograph in Kai-Olaf Hesse’s Topography of the Titanic seems symbolic: a tiny image of the doomed liner sailing from Belfast on her sea trials. Apart from one other contemporary photo, of the ship alongside Thompson Graving Dock, that is the last we see of her, except in the form of paintings, models and dioramas. The Titanic has sailed away to her Atlantic rendezvous, leaving behind – what, exactly? A memory, a narrative, a myth, above all an absence. The absence of the ship, and also the virtual disappearance of the industry which built and launched her. The trials of the Titanic’s crew and passengers, their treasons and heroisms, have passed into contemporary legend. In the process, their story slipped sideways from tragedy to melodrama and finally to sentimentality; what might once have been the subject of a grand opera or a vast painting, perhaps by Géricault, has now become the stuff of Hollywood blockbusters. The tragic element was there from the start, of course, in the form of overweening hubris: a White Star Line publicity booklet published nearly a year before the fatal voyage featured on its cover the illustration of an unstoppable leviathan steaming full speed ahead, seemingly about to ride down a humble cutter scuttling to escape the onrushing bow wave. And as we now know, the Titanic’s collision did not result in horrendously extensive damage, as was first suggested; instead, the buckling of a mere twelve square feet of steel plates was enough to ensure that the ship would flood and eventually break into two and sink. The process by which history was gradually subsumed into myth, and the reasons behind it, are less clear. Why is it that certain events, people or even ships pass into legend, and others, perhaps equally dramatic or cathartic, fall into oblivion? Why, for instance, is it that the fate of the Titanic is familiar to millions today, while knowledge of the Lusitania, the Deutschland or the Méduse grows steadily fainter? Part of the answer, perhaps, is that unlike the stories of those other unfortunate ships, the myth of the Titanic has become closely entwined with a specific locus – that of its birthplace, Belfast, and the city’s once-proud shipbuilding industry. 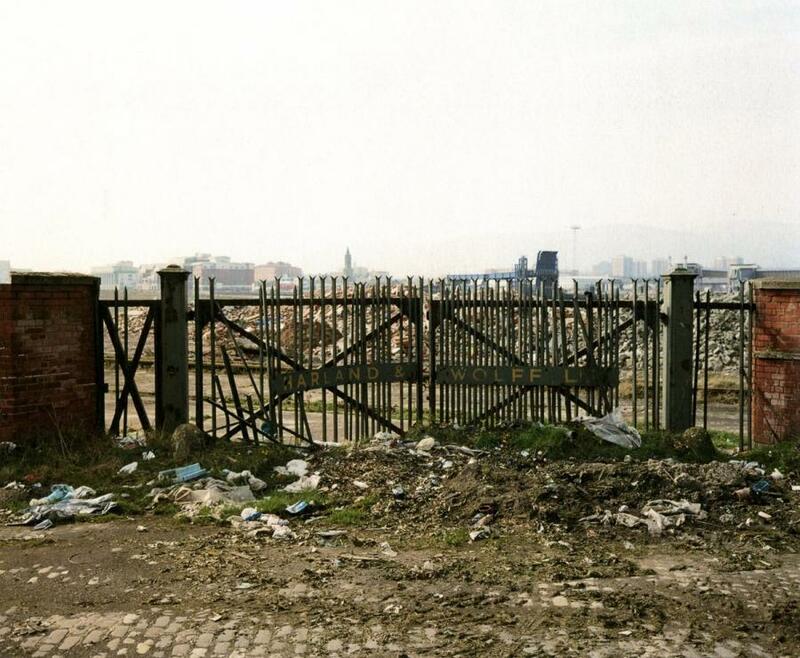 Harland & Wolff and Queen Island are no longer what they once were. Nationalised in 1977, the company was subsequently bought out by a consortium in 1989 and renamed Harland and Wolff Holdings plc. Company headquarters have moved away, leaving the grandiose original buildings empty. On its website, the successor company describes itself as “a technically-led project management organisation which is structured and organised to maximise opportunities in its chosen market sectors”; a subsection of the website is labelled ‘Recruitment’, but at the time of writing, enquirers are advised that there are no vacancies, and encouraged to “please try back later”. In its heyday during World War II, the workforce is said to have peaked at around 35,000 people. Sometime during the next decade or so, Queen’s Island is destined to be reborn as Titanic Quarter, with a “blue-chip technology district” emerging in the shadow of Samson and Goliath, Harland & Wolff’s giant gantry cranes; now scheduled historic monuments, the 100-metre tall cranes will probably still be there long after blue-chip technology has gone the way of shipbuilding. Also promised is “a major Titanic-themed attraction”, for some perhaps a rather unsettling prospect. In the meantime, Kai-Olaf Hesse’s photographs reveal the Titanic’s birthplace in the early years of the 21st century to be a desolation haunted by the events of April 1912, events which took place hundreds of miles away. Harland & Wolff are gone, the shipbuilding industry is on its last legs and the jobs have vanished: it is hardly surprising that Hesse’s lens has not recorded a single human being. Instead, we wander though a city of the dead more complex than Pompey, a geography characterised by a bewildering variety of barriers, enclosures and partitions: breezeblock walls, razor wire, chain link fencing, steel gates, security barriers and hedges separate one part of the wasteland from another. Enclosed metal staircases lead from nowhere to nowhere, the doors and windows of still standing buildings have been boarded up. In one surrealist twist, a bright orange lifebelt by Lagan canal has been carefully fenced off and rendered inaccessible to anybody who might need to make use of it. Scattered throughout these labyrinthine ruins are small, almost inconsequential memories of the sinking; an absurdly tiny souvenir bust of Captain Edward John Smith on a windowsill, or the small twists of rusting iron armature which are all that remain of the Titanic’s original gantries on the slipway. Can absence be recorded photographically? Kai-Olaf Hesse certainly appears to have done so, for his images resonate with what is no longer there. They are sober, reflective and absolutely merciless; here is no ship, no industry, no life to speak of. I had not thought death had undone so many. First publication, Kai-Olaf Hesse, Topography of the Titanic, Belfast Exposed Photography & ex pose verlag, 2007. John Stathatos: The Absence. Kai-Olaf Hesse's "Topography of the Titanic"